Aeonix is a software only communications solution that consolidates disparate business applications into a single, fault tolerant platform. 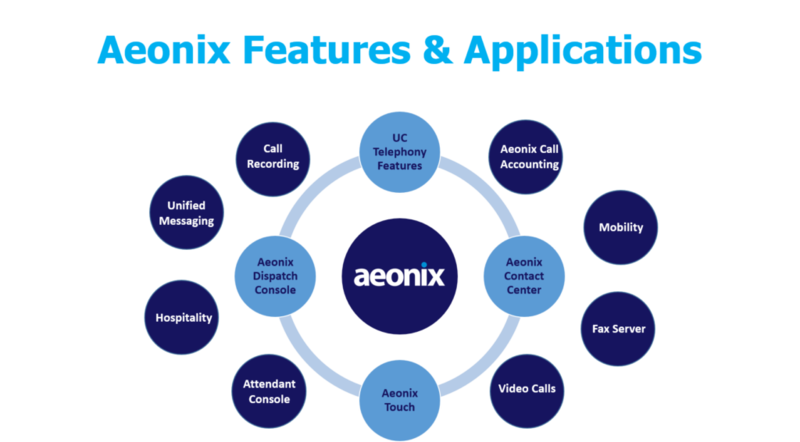 The Aeonix Unified Communications platform, Aeonix Contact Center(ACC), and Aeonix Dispatch Console (ADC), all reside in one virtual instance or COTS server. Aeonix runs on any virtualization platform including VMware, Hyper-V and cloud platforms, and can easily port from one platform to another (“Bring Your Own Cloud”). Cloud based, hybrid or on premises, Aeonix provides the same enterprise grade feature set and capabilities. Aeonix’ unparalleled scalability allows immediate ROI for a Managed Services practice. Other advantages of the Aeonix include simplicity of implementation and maintenance, and support for open standards such as SIP (unmodified), CSTA, and Web Services. Scalability– Aeonix’s open architecture allows customers the flexibility to buy and install only what they currently need, and to add users, remote locations and additional applications as they become necessary. The standard system solution has the ability to provide service from 20 to 25,000 users using the same software, applications and endpoints. Simplicity– Aeonix includes unified management of all system services and applications. An intuitive GUI and a simple licensing mechanism make it easy to deploy, manage and maintain. Adding users, remote sites, or applications to one Aeonix server automatically updates all Aeonix servers in the network. Open Architecture– Aeonix supports standard protocols such as SIP (unmodified), CSTA, and Web Services. This architecture allows customers to seamlessly integrate a variety of common applications and to add desired devices to the system. Aeonix security ensures system integrity and prevents unauthorized operations. Resiliency– Aeonix is a distributed solution with no single point of failure using a unique implementation of Active-Active high availability. It delivers the highest level of fault tolerance and proactive resiliency. Aeonix delivers powerful, flexible, and adaptable communications to enterprises both large and small . Its simple unified management structure ensures that customers experience the lowest total cost of ownership (TCO) with minimal IT resources required.